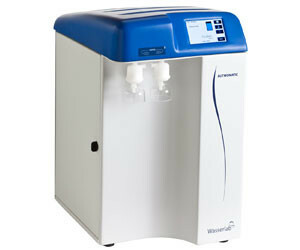 The Autwomatic Plus 1+2 Water Purification System from Wasserlab has the ability to produce three qualities of purified laboratory water used direct from the mains water supply: Type I ultrapure water for HPLC, ICP-MS, IC, TOC analysis, molecular biology, PCR, cell culture, DNA sequencing and monoclonal antibody production; Type II pure water for general laboratory applications such as preparation of microbiological culture media, reagents and buffers, RIA/ELISA, atomic absorption and flame spectrophotometry; and osmotised water for cleaning of feeding autoclaves or washing machines. 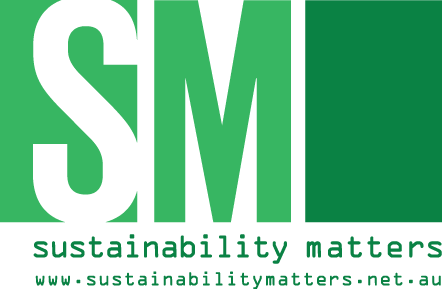 The system can be connected directly to the tap water to produce Type I, II and III water to the ASTM standard. It is offered in several models, with Type II water production rates of 3, 5 or 10 L/h and with storage tank options of 10, 30 and 50 L. Type I water is produced at 1.1 L/h. An integrated UV lamp (185/254 nm) reduces organic contamination to <3 ppb and the ultrafiltration module ensures a bacterial count of <1 cfu/mL and endotoxin count of <0.03 IU/mL. Dispensing is manual, time-controlled or volume-controlled. All parameters can be monitored via an 11 cm touch screen, and detailed information such as the hours of installation, hours of operation and volumes produced is easily accessible. The cartridge system facilitates quick and easy drip-free changes. 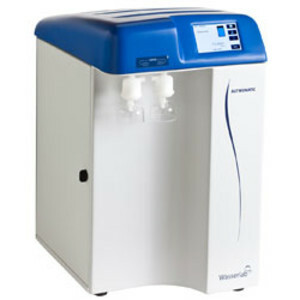 I am interested in Wasserlab Autwomatic Plus 1+2 for Type I, II and III lab water .